It’s spring 2019 and crises are coming thick and fast, but one of them which may have an extra deep, extra wide, extra lasting, and extra invisible impact is the new proposed EU Copyright Directive, whose Article 11 and Article 13 propose, among other things, to (A) radically and permanently change who owns news and has a right to circulate and report it, (B) demand filters to preemptively censor content that will be expensive, automated, easy for trolls to exploit, and difficult for people to appeal, and (C) put huge expensive requirements on creators of online content which will make it basically impossible for individuals or small groups to create and launch new web spaces, making it much harder for anyone but established media giants to create new content. 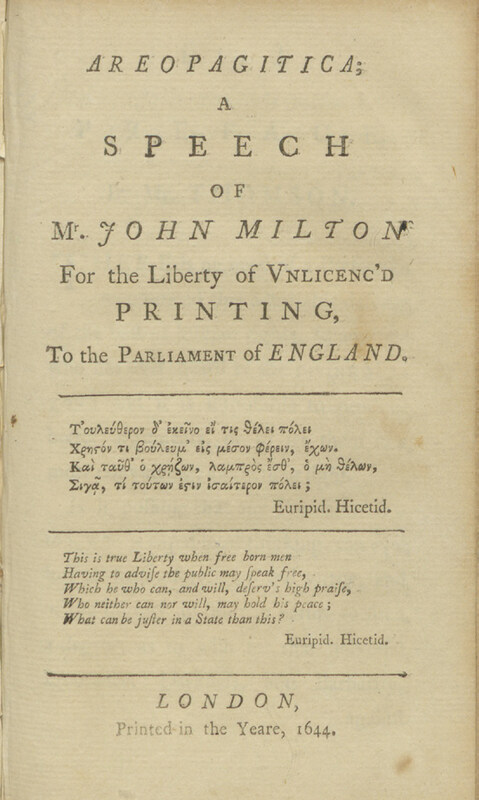 I wrote a short essay about the issue this morning, “How #Article13 is like the Inquisition: John Milton Against the EU #CopyrightDirective” looking at how this crisis resembles the print revolution, but it ended up being posted on BoingBoing, instead of here, so I hope you enjoy it. I’ll also add that, after a year looking at how information revolutions stimulate new kinds of censorship, my take-away is this: information revolutions democratize speech and thus make marginal voices louder. Whether today or 400 years ago, many of these are radical voices, voices which were marginalized and silenced in traditional fora and thus have an extra incentive to go to the effort to adopt new methods. these radical voices tend to be at all fringes of politics: radical religion, radical conservatism, radical progressivism, radical sexualities and identities, fire & brimstone preachers and civil rights advocates, Calvinist visionaries and GLBT groups, Voltaire and the KKK. This has a thousand consequences, but one is that it scares governments, and makes publics easy to rile up against frightening new voices. And that makes it easy for corporations and other profit-seeking actors to lobby for policies that they claim are to protect speech, or protect journalism, or protect the country, or protect children, etc. but are actually framed to maximize their own profits. Frightened governments and alarmed populaces are very vulnerable to this manipulation. It happened in the 1640s. 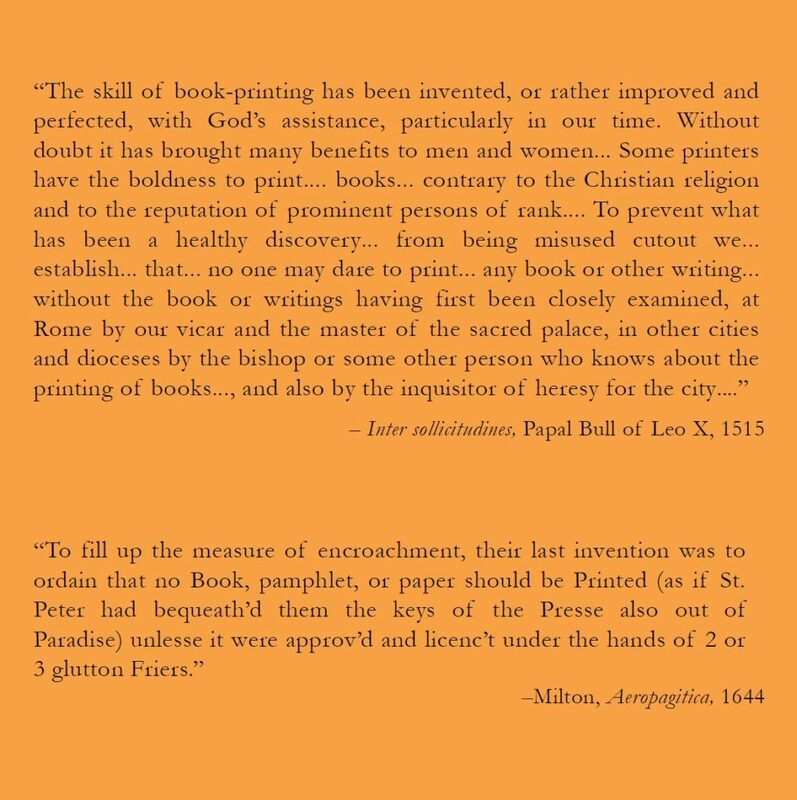 It’s happening right now, and we in the digital revolution need to look very seriously at John Milton who fought against this (and failed) during the print revolution if we want to learn from earlier mistakes and protect the internet as the most powerful engine of public knowledge and empowerment ever created. So please, read up about the crisis, and, if you can, take action! If you want to learn more, here is a short segment from my series on Censorship and Information Control During Information Revolutions which talks about the history of ownership of news, and you can learn more from the project, or read the transcript of our session on who owns the news. If you want a book on the topic, I recommend Adrian Johns’s Piracy: The Intellectual Property Wars from Gutenberg to Gates and Who Owns the News? A History of Copyright by Will Slauter (both in the video below). Meanwhile, I have a new proper Ex Urbe essay mostly done, about teaching Machiavelli and historical letters, which I hope to share soon! Thanks for staying on this. It seems they went ahead and passed it despite protests. When was that system dismantled in Britain? It might be helpful to look to the time when anti-censorship won.